The history of St. Thomas Aquinas parish begins around 1942. 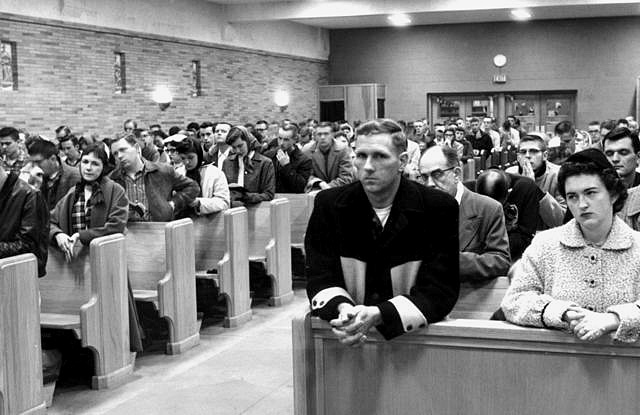 By then, the Catholic student population at Iowa State College, spurred by interest in the naval training program, had grown to a number that no longer could be reasonably accommodated at Ames' lone Catholic parish, St. Cecilia, which was located at that time just west of downtown. Rev. John Brickley and later Rev. Joseph Kleiner received permission to hold weekend liturgies in the Memorial Union Great Hall at Iowa State and keep an office on campus for the pastoral care of students. During these years, Archbishop Henry Rohlman corresponded with Rev. Nicholas Steffen, pastor at St. Cecilia's, about purchasing property near the campus. In 1945, St. Cecilia parishioner and real estate professional John Judge negotiated for the purchase of Porter Lodge on Lincoln Way between Ash and Lynn avenues for $13,800. With two interior walls removed, the building became a chapel in which daily Mass was celebrated and private instructions and counseling were available to students. St. Thomas Aquinas Church and Catholic Student Center was incorporated on April 8, 1947. Rev. James Supple, following two years as an Army Air Corps chaplain and a short appointment in La Porte City, was appointed as the first pastor. The parish consisted of 75 families and 1,154 students who worshipped in what would become known as "The Old House." Ground was broken for the Newman Student Center and Chapel on Sept. 14, 1948. The chapel, located in the basement and seating 300, was dedicated on Dec. 11, 1949, by Archbishop Rohlman. The rest of the building, which included offices, lounge and the priests' living quarters, was dedicated May 4, 1950, by Archbishop Leo Binz. 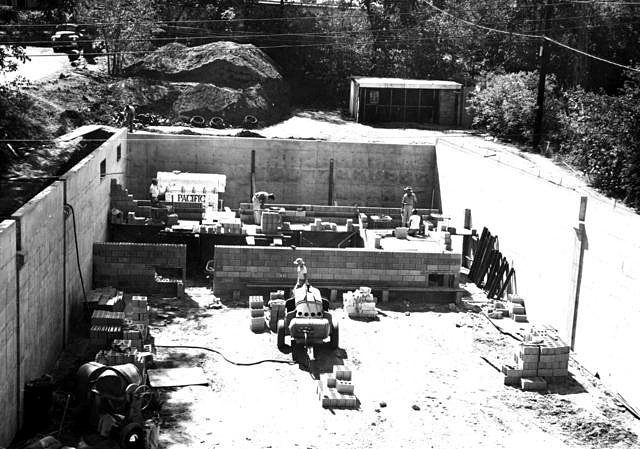 1953 brought two changes to the face of St. Thomas: "The Old House" was torn down and construction began on the basement of the new church -- which actually served as a second (but larger) basement church for a decade. This basement church seated 400 and was dedicated on May 24, 1954. The space previously occupied by the student center chapel became a lounge, kitchen and social facilities. With resident families numbering 175 and Catholic student enrollment exceeding 1,300, erection of the church -- above the "basement church" -- began in July 1962. 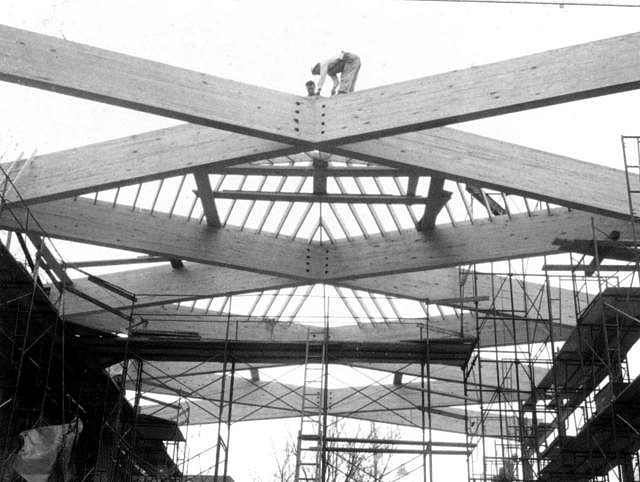 The 900-seat facility, built at a cost of $450,000, was dedicated on Feb. 2, 1964, by Archbishop James Byrne. James Thompson & Sons, Ames (precursor to Story Construction) was the contractor on all three projects. A remodel of the sanctuary a decade later moved the altar from the center of the space to the east wall. By 1994, the parish included 800 families (including 250 graduate student families), and Iowa State enrolled an estimated 6,000 Catholic students. The need for more space, particularly for campus ministry and religious education programming, was evident. That year, the parish purchased from Phillip O'Berry a boarding house at the corner of Ash Avenue and Lincoln Way, clearing the way for a major expansion of the St. Thomas Aquinas building. 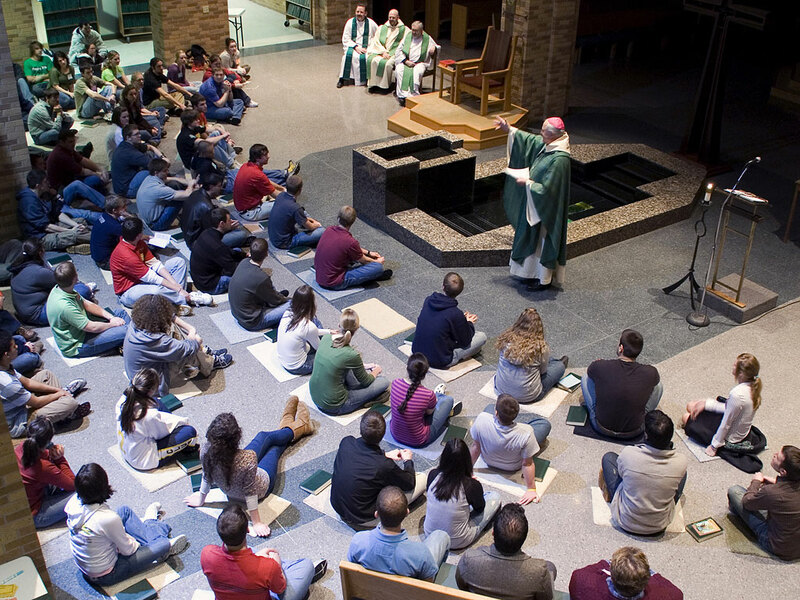 Six years later, on April 29, 2000, Archbishop Jerome Hanus visited Ames to dedicate renovated (28,400 square feet) and new (18,100 square feet) worship and office space. New construction added religious education classrooms, staff offices, an apartment for the peer ministers and a spacious gathering and sacramental area to the east side of the worship space. It also made nearly all areas of the building accessible. Story Construction was the general contractor on this $5.2 million project, for which a capital campaign had begun in 1994. The debt was paid off in 2008. The next expansion in the parish was about making more room not for worshipers but their vehicles. Growing concern about the size (42 parking spaces) and safety (steep gradients, propensity for double parking) in the lot south of the church caught the attention of an anonymous donor, who provided a $3.2 million gift for a two-level parking deck. 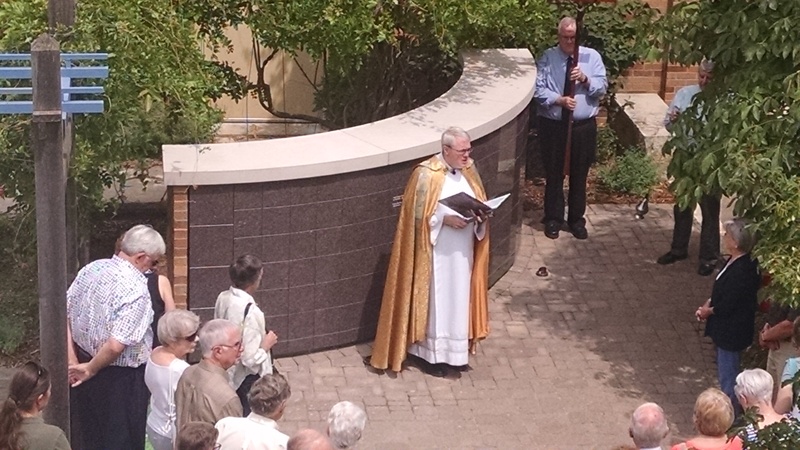 In October 2011, the parish's nine-apartment Cardinal House on Ash Avenue was demolished to create space for the deck, and by Thanksgiving week 2012, parishioners were using the new structure. RDG Planning and Design was the architect and Harold Pike Construction was the contractor on the $3.3 million project. 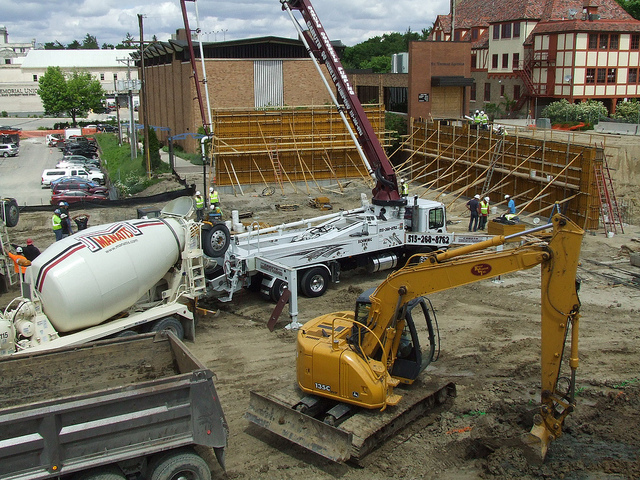 There is space for 75 vehicles on the lower level, accessible from Lynn Avenue, and 96 vehicles on the upper level, accessible from Ash Avenue. The parish community dedicated its parking structure on May 4, 2013. St. Thomas Aquinas' parish council was formed in 1966 to coordinate student and resident parishioner participation with the work of the staff in the responsibilities of the parish. St. Thomas Aquinas was one of the first parishes in the Archdiocese of Dubuque to form a parish council. A Vatican II directive urged Catholics to assume a more personal responsibility for the effective functioning of their parishes. 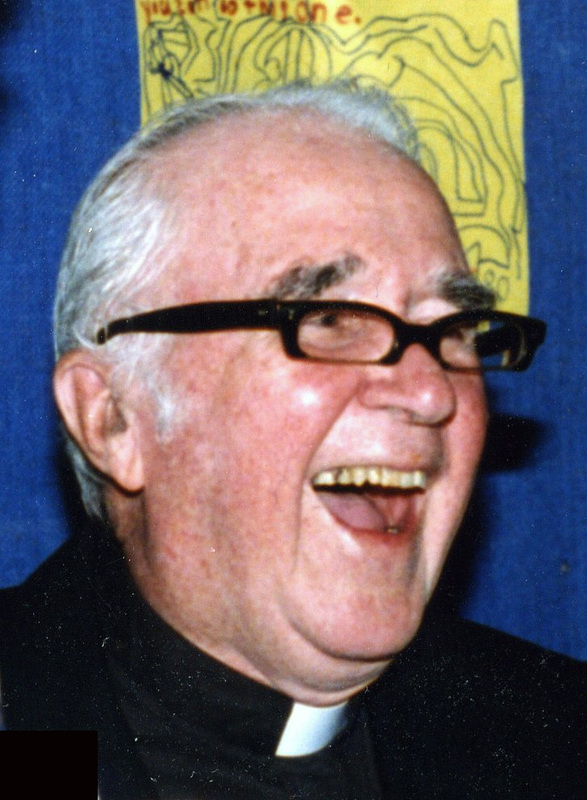 The 1976-77 academic year marked the first year of the peer ministry program, which began under peer minister Tom Cordaro. In the early years, peer ministers visited Catholic students at Iowa State in their residence halls, personally inviting them to a Thursday Night Liturgy (also initiated at this time) or, on a smaller basis, to a weekly meal the peer ministers served in a lounge of the building. In the mid-1990s, peer ministers' assignments became more focused, and each peer minister had a team of student volunteers that helped him or her. 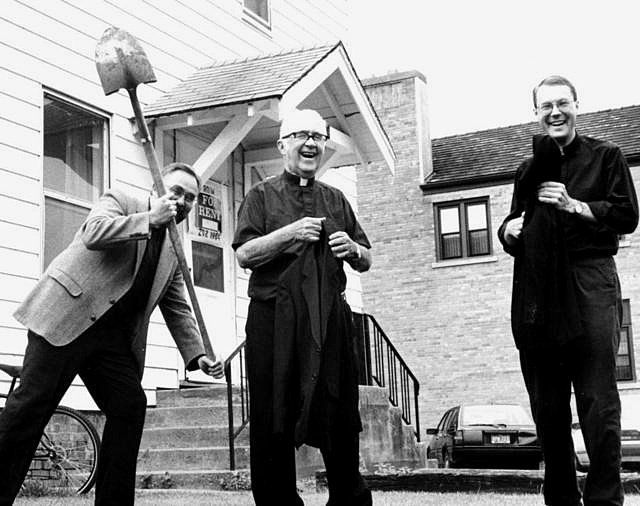 With the 2000 expansion of the St. Thomas Aquinas facility, free housing on site became an added perk for peer ministers. The parish's Love your Neighbor program assists local people in need, typically by providing funds for rent and utility bills. It is funded by a percentage of the weekend liturgy collections (currently 4 percent), donations from individuals and, occasionally, grants from other sources. The fund was established, circa 1980, with a gift from parishioner Esther Burns, who wanted specifically to help Vietnamese refugee families who were resettling in Ames. The Parish Family Life Commission petitioned the Parish Council to tithe, initially 2.5 percent, from the offertory collection to add to the fund. For the first few years, a staff member interviewed potential recipients when a need for financial help arose. In 1987, parishioners Mary Terpstra and Mary Concannon helped move the program in a new direction with trained volunteer interviewers and scheduled interview times. In recent years, $70,000 from the fund is awarded annually to assist families and individuals in the Ames area. 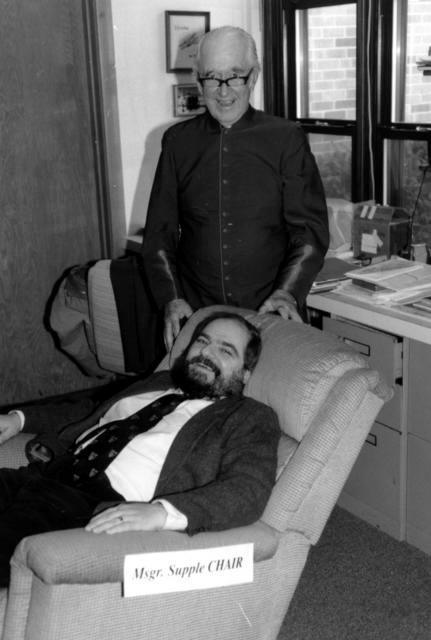 The Monsignor James Supple Chair of Catholic Studies at Iowa State University was established in 1997 to provide funding for a faculty member in the department of philosophy and religious studies who teaches courses in Catholicism. It also supports a lecture series at the university. 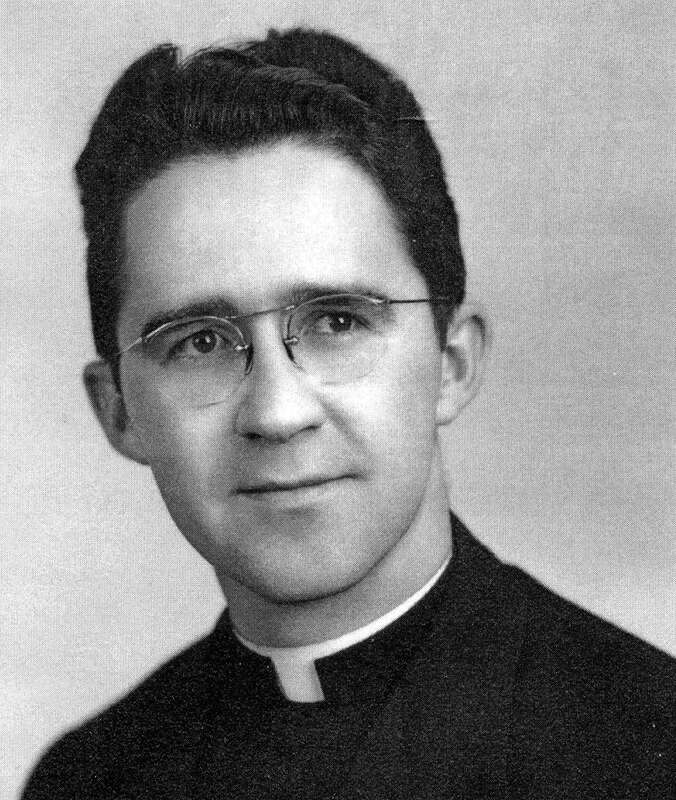 A theology chair in Catholic studies had been a dream of founding pastor Fr. Supple for nearly 30 years. The $1 million endowment for the chair was created through gifts from the Supple Endowment Fund at St. Thomas Aquinas, ISU alumni and Ames residents. Jaime Vidal was the first holder of the chair (1997-1999). The Supple Endowment provided $100,000 for a visiting Catholic scholar program at the university (1994-1997) prior to the successful creation of the endowed chair. The idea of a columbarium on the parish property -- a final resting place for the cremated remains of parishioners -- was driven and researched by a small committee of parishioners at a time when cremation was gaining support as an internment option. Beginning in 2014, the group held informational meetings after Masses, assessed interest among parishioners and answered many questions put forward by the pastoral council regarding cost, weight, location, diocesan approval, construction, use policies and management responsibility. By summer 2015, it had the answers and approvals it needed. Eickhof Columbaria of Crookston, Minn., was selected as the contractor and the prayer garden south of the worship space as the outdoor location. When the parish dedicated the columbarium on July 31, 2016, 70 of its 120 niches had been sold, which more than covered the $67,000 project.